HomeJournalsHow Does Religious Belief Affect Anti-Immigration Sentiment? How Does Religious Belief Affect Anti-Immigration Sentiment? July 24, 2015 Journals Comments Off on How Does Religious Belief Affect Anti-Immigration Sentiment? 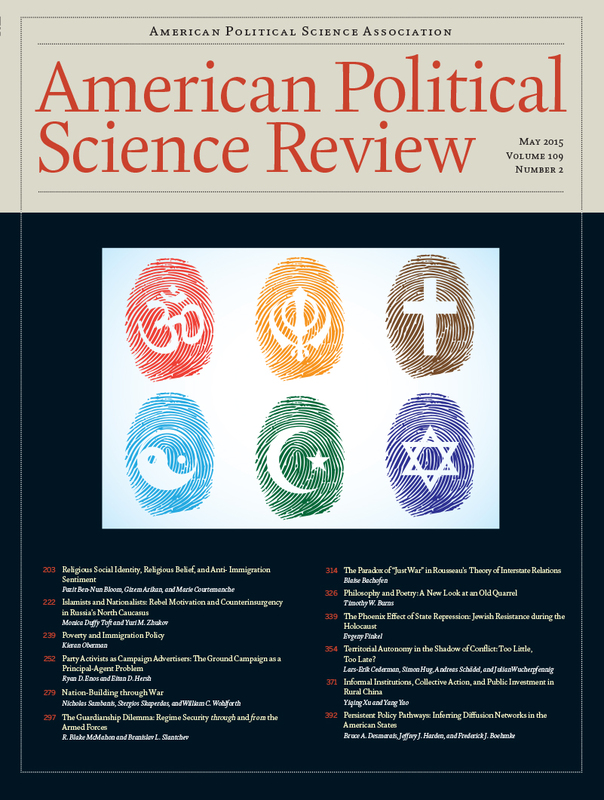 APSA and Cambridge Journals would like to provide complimentary access to articles from the latest issue of the American Political Science Review. Download this article for free until August 21, 2015 by using the link provided below. From the Abstract: Somewhat paradoxically, numerous scholars in various disciplines have found that religion induces negative attitudes towards immigrants, while others find that it fuels feelings of compassion. We offer a framework that accounts for this discrepancy. Using two priming experiments conducted among American Catholics, Turkish Muslims, and Israeli Jews, we disentangle the role of religious social identity and religious belief, and differentiate among types of immigrants based on their ethnic and religious similarity to, or difference from, members of the host society. We find that religious social identity increases opposition to immigrants who are dissimilar to in-group members in religion or ethnicity, while religious belief engenders welcoming attitudes toward immigrants of the same religion and ethnicity, particularly among the less conservative devout. These results suggest that different elements of the religious experience exert distinct and even contrasting effects on immigration attitudes, manifested in both the citizenry’s considerations of beliefs and identity and its sensitivity to cues regarding the religion of the target group. We hope you enjoy your complimentary access.